value rich handsets. Nokia C3-01 Touch and Type is another offering from the Finnish mobile phone manufacturer aimed for users longing for easy access to messaging and social networking sites. However, the phone is not in the league of other high end sets manufactured by Nokia such as N9, E7 etc. 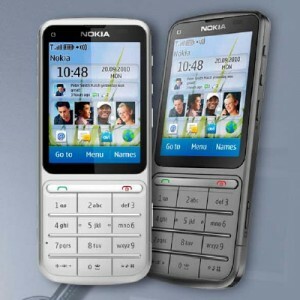 At a first glance, Nokia C3-01 Touch and Type looks pretty much similar to Nokia 6700 Classic. The phone boasts of a standard alpha numeric keypad and has a brushed metal finish. The phone is slim and has a solid feel. C3-01 is slim measuring 111 x 47.5 x 11 mm and is extremely light on your pocket weighing just 100 grams. You can find the camera and volume adjustment buttons on the side of the phone. The rounded edges of the phone make it comfortable to grip and on the top of the headset you will find a micro-USB connector, headset connector and a plug for charging the device. The 2.4 inches TFT touch-screen is not very large as compared to other touch screen cell phone available in the market. The screen is capable of displaying 256K colors of resolution measuring 240×320 pixels. The user interface of the phone has been reorganized and the onscreen buttons are big. The disappointing part is that since the touch-screen is more of a resistive type, you have to exert some sort of force to use it. We felt that the touch-screen could have been made better. Networking and Connectivity plays a major factor for the sale of any smartphone. If a smartphone has poor connectivity and networking facilities, then communication becomes extremely difficult. Nokia C3-01 supports both 2G (GSM 850 / 900 / 1800 / 1900) and 3G (HSDPA 850 / 900 / 1900 / 2100) network. There is support for GPRS (Class 10 (4+1/3+2 slots), 32 – 48 kbps) and EDGE (Class 10, 236.8 kbps) too. Connectivity is further enhanced by Wi-Fi 802.11 b/g/n along with Bluetooth 2.1 with A2DP support. The phone, however, lacks GPS support. The phone boasts of a stereo FM radio with RDS along with support for various video and music formats. The music player of the phone is capable of playing MP3, WMA, WAV, eAAC+ music file formats while the video player supports MP4, H.263, H.264 and WMV video formats. Camera has now become an integral part of high-end phones which allows you to instantly click the moments you want to capture. 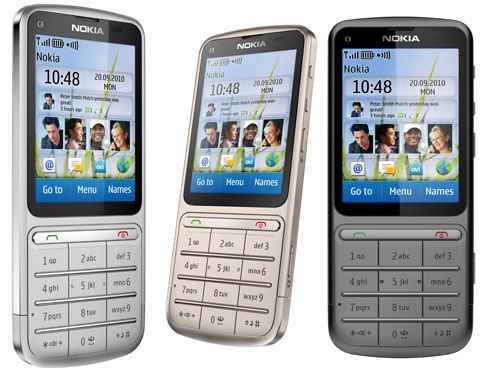 Nokia C3-01 is equipped with a 5 mp camera which lets you click photographs of resolution measuring 2592×1944 pixels. The camera is equipped with LED flash which lets you click sharp images even in dim light. The video recording is slightly sluggish though. You can record videos at VGS@ 15fps. Secondary camera for video calling is absent. The phone is powered by a Li-Ion 1050 mAh battery which offers a talk time of approximately 3 hours when the phone is operated on 2G and 5 hours when operated on 3G. Standby time on 2G is around 400 hours and around 300 hours when operated on 3G. The phone announced in September 2010 has been released in October 2010. In the USA, the phone is priced at $ 200 (approx) while in the UK it is priced at £150 (approx). In India, the phone is priced at Rs 9000 approx. 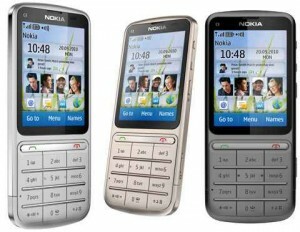 Nokia C3-01 Touch and Type is a budgetary smartphone aimed at masses. If you want touch screen experience at a cost effective price point, then you can definitely bank upon this phone. The phone has nothing extraordinary to boast about itself and at the same time does not have any major drawbacks, considering its price range. With C3-01 Touch and Type, Nokia has once again proved its mettle in rolling out quality phones for masses.